Some people think a trip to a Disney Park is only for families with kids. Those poor unfortunate souls! 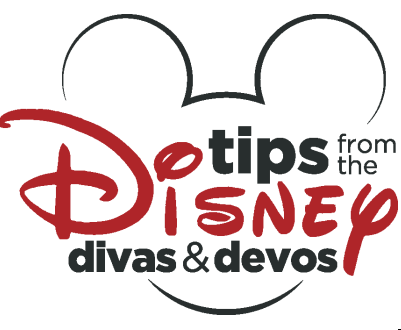 Disney Parks have fabulous entertainment, restaurants, attractions, and live performances that are sure to please anyone of any age! On our trip to Disneyland to celebrate my husband’s birthday, we brought along our grandchildren and adult children. My son’s girlfriend, Emily, even agreed to join us. We all had a magical time, enjoying time together as well as time exploring individually. While some of us were barreling down Big Thunder Mountain, and others were preparing for runDisney races, Mike and Emily were able to enjoy a date night at California Adventure. 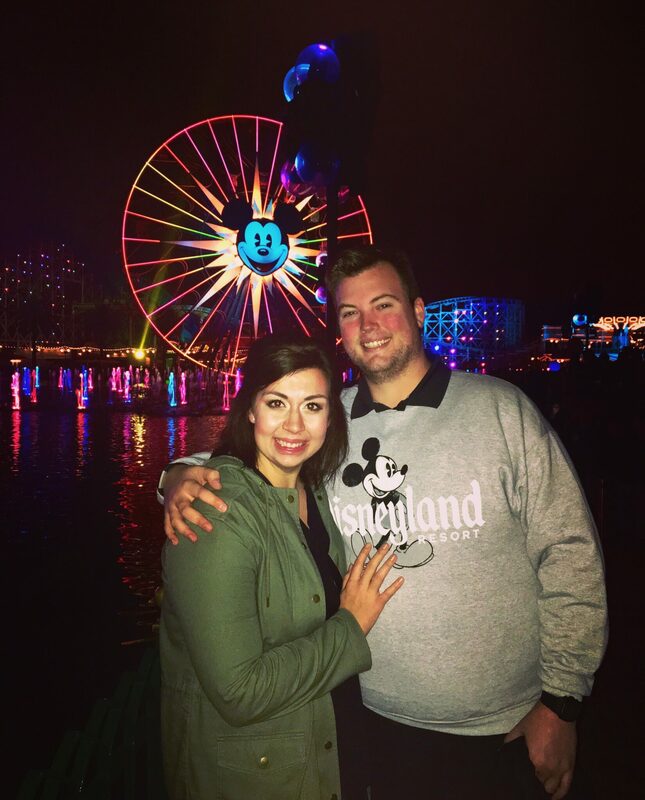 I typically stray away from using the word “perfect”, but a date night at Disney’s California Adventure (DCA) is as close to perfect as it can get. 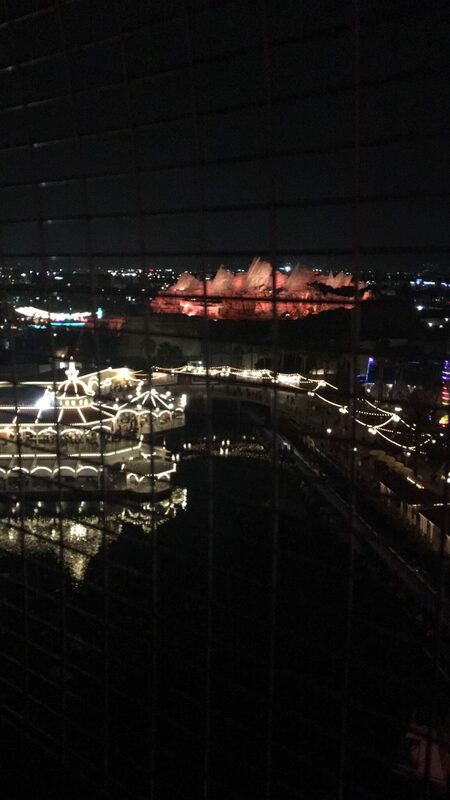 From the views to the entertainment to the dinner and drinks, our night was truly a fairytale. 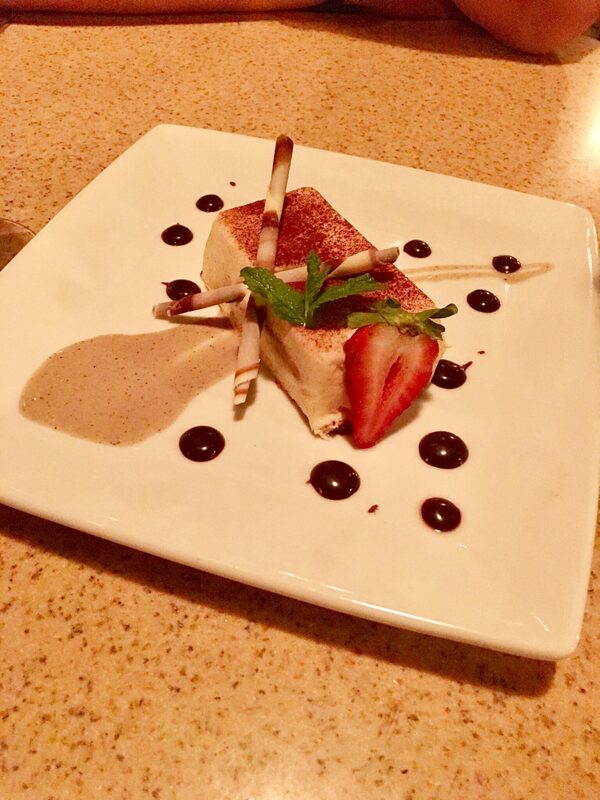 As most of you know, the perfect date night begins with making a reservation. Given the popularity, this is doubly true for dining at any Disney park. 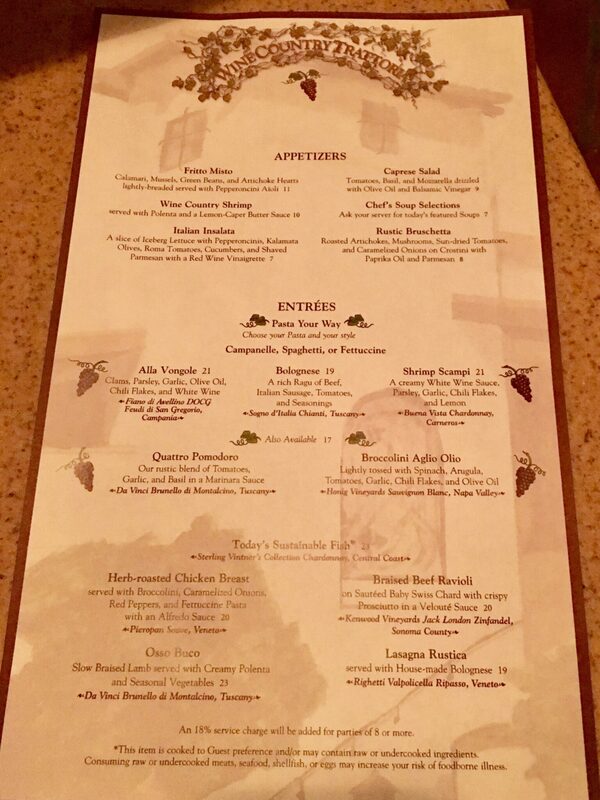 We made a reservation at Wine Country Trattoria using the Disneyland app about 2 weeks before our trip. The app is such a useful tool, as you are one click away from accessing the menus to all the restaurants and making a reservation. 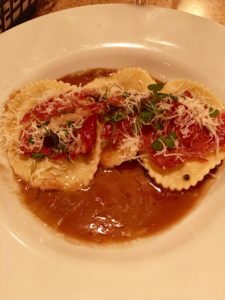 We were excited about some of the dishes at Wine Country Trattoria, and the wine list didn’t hurt either. Goofy joins in the fun! Fast forward two weeks, and we were not disappointed. Our reservation was at 6:20 pm, but we arrived early to have some leisure time at the park prior to dinner. We were lucky enough to catch some street entertainment on the way. 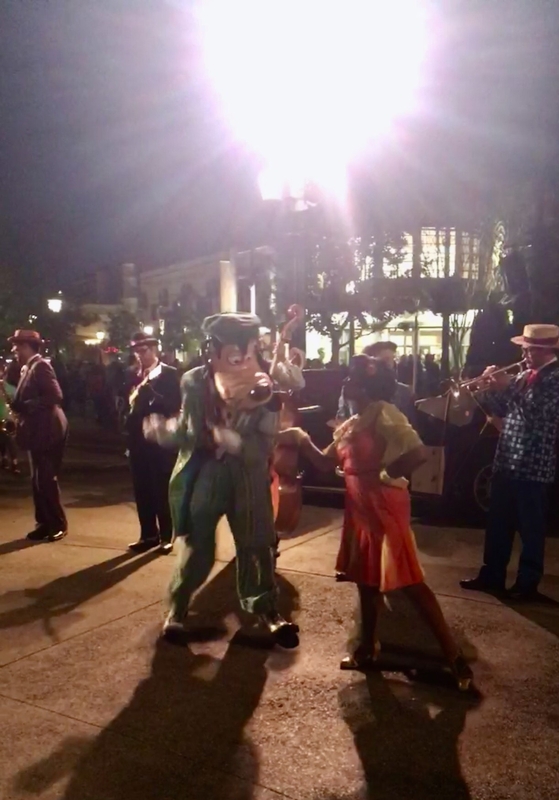 Five and Dime jazz group was performing on Buena Vista Street, and it was a great start to our evening. The lead singer had a beautiful voice, and the whole show was delightful. Goofy even joined in on the fun for a few numbers! After the show, we walked to Wine County Trattoria, taking in the beauty of DCA at night. We checked in the with the hostess 20 minutes early to confirm the reservation. While we were waiting to check-in, we overheard the hostess tell a group that the restaurant was booked for the night, making us thankful that we made the reservation 2 weeks in advance. The hostess took a phone number to text us when our table was ready. 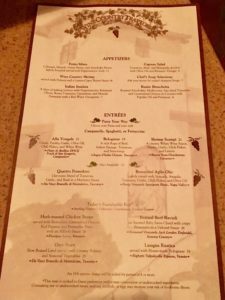 Since we still had about 20 minutes until our reservation time, we decided to check out the Alfresco Tasting Terrace, which is just upstairs from Wine Country Trattoria. Although we had limited time to enjoy the Tasting Terrace, we were so glad that we ventured upstairs. We ordered the “Big Reds” wine flight, which consisted of 3 2-oz tasting glasses of some of the delicious wine. Even though the wine was tasty, the views that the Tasting Terrace offered were definitely the highlight. 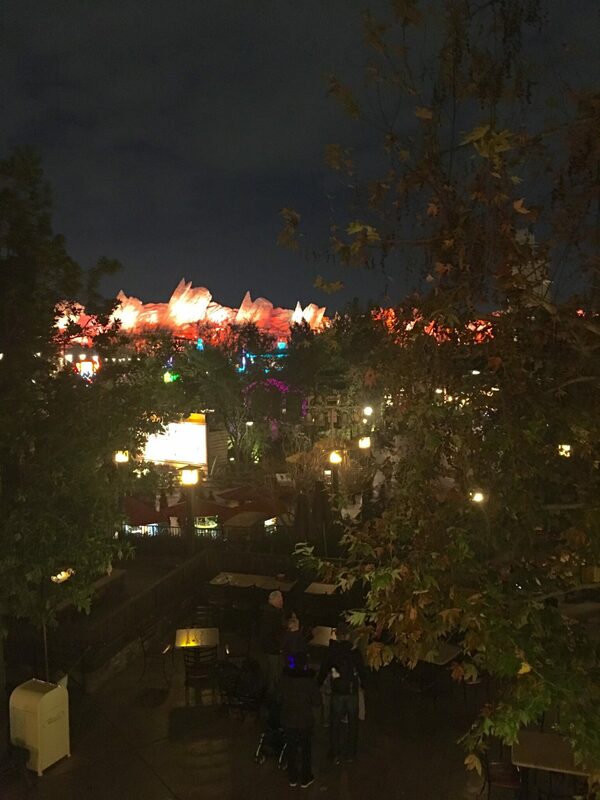 We were lucky enough to be seated on the edge of the terrace, where we had an ideal view of the DCA lights, landscaping and a picture-perfect panoramic of Radiator Springs. We didn’t even have to wait the full 20 minutes before we received the text that our table was ready. Wine Country Trattoria has a large, beautiful patio, which is where we were seated. 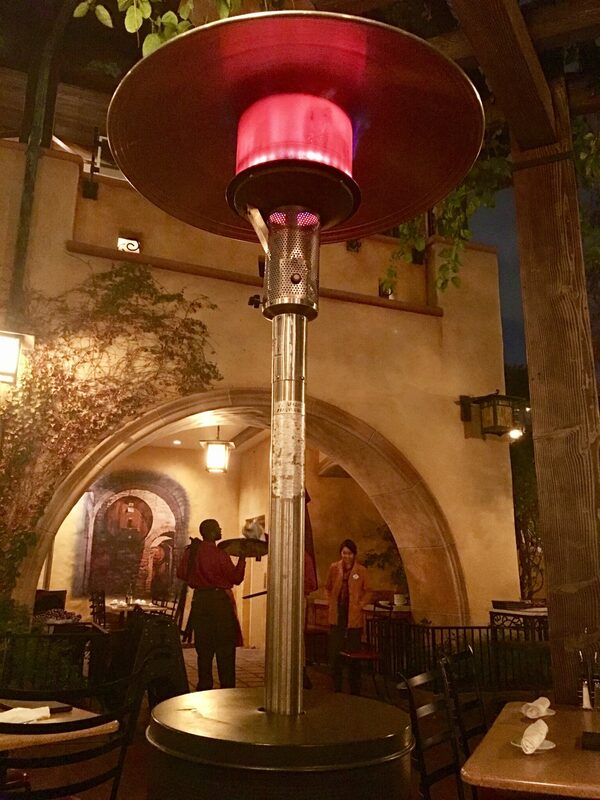 It was a chilly night, so we were happy that a large heat lamp was right next to our table. Anna, our waitress, was a delight. 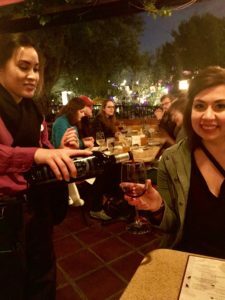 She was very kind and attentive, and even went along with our request to take a picture while she was pouring our first glass of wine. We ordered a bottle of Kenwood Jack London Zinfandel, which we both thought was reasonably priced. To start our meal, we were given a bread basket. Bottles of olive oil and balsamic vinegar were already on the table, and were perfect for dipping the bread in. We decided to order Fritto Misto as an appetizer, which is an assortment of lightly breaded and fried vegetables and seafood. It was served with a pepperoncini aioli, which was a great compliment to the dish. For the main course, I ordered herb-roasted chicken alfredo. 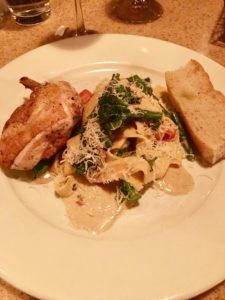 The dish consisted of a juicy chicken breast and fettuccini pasta topped with a creamy alfredo sauce, broccoli and red peppers. The meal was loaded with flavor, but surprisingly light, which is a rarity in dishes containing cream sauces. The freshness of the vegetables really helped to balance the rich sauce. Altogether the meal was a lovely second course. So much so, that I finished the entire dish. 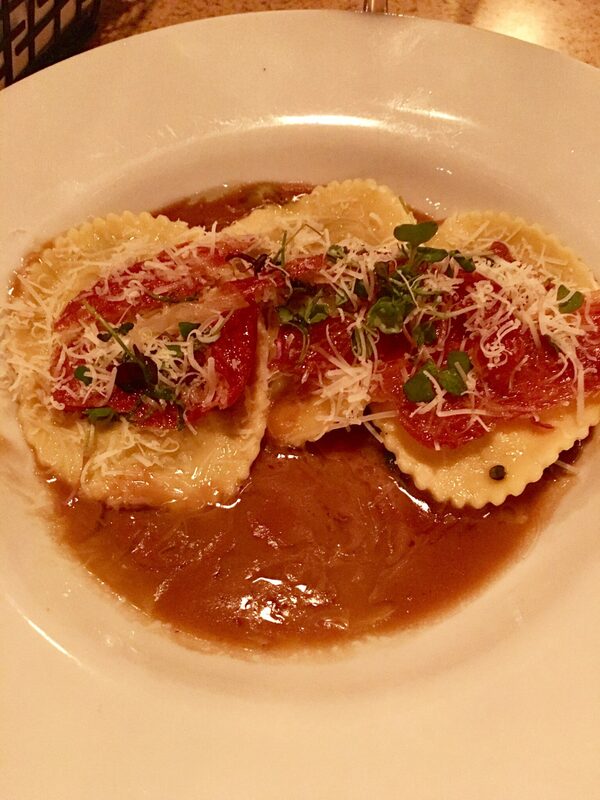 My boyfriend ordered braised beef ravioli, which was served with sautéed baby swiss chard and crispy prosciutto all covered in a beef velouté sauce. 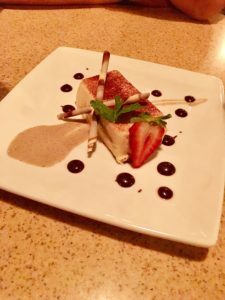 He had chosen this specific dish because it was the suggested pairing for the wine we had ordered, and he agreed that it complimented the wine very well. Although the dish was very rich, the bitterness of the swiss chard and the saltiness of the prosciutto added depth to the rich flavor. He too was very impressed with the entree. Despite the fact that we were both nearing the point of overindulgence, we decided that dessert was a must. Due to being stuffed, we opted to share a desert rather than ordering individually. My boyfriend insisted on tiramisù, but I will admit that passing on the Ghirardelli cannoli trio was challenging. That being said, I was not disappointed by the tiramisù. It was the perfect light desert to end the multiple course meal. Not too sweet, but delectably full of flavors of espresso, mascarpone and chocolate. In addition, it was so aesthetically pleasing that it was actually difficult to dig in, for fear of ruining the beautiful dish. Our dinner was so delectable that we did not want the night to end. Although we did have to eventually leave Wine Country Trattoria, our date night was far from over. 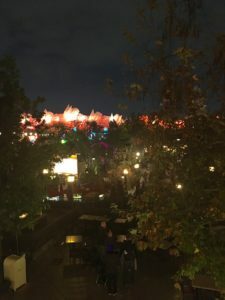 We had fast passes for World of Color, and time to spend before we needed to secure our spots for the show. 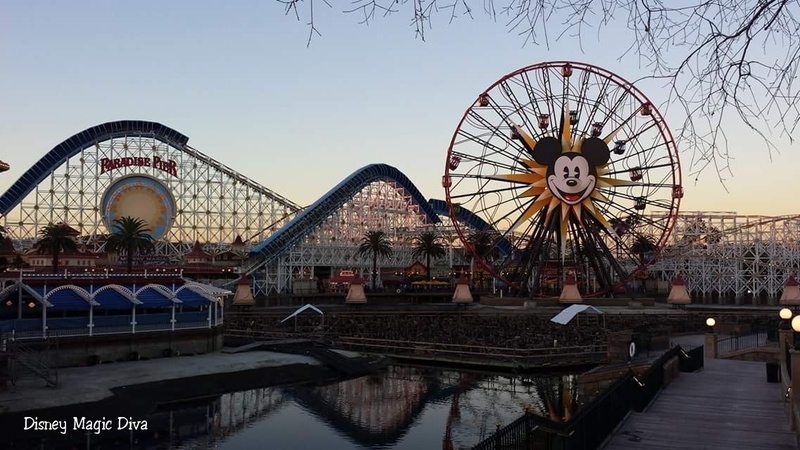 We decided to continue our trend of finding beautiful views of DCA, and got in line for Mickey’s Fun Wheel. My boyfriend was staunchly opposed to trying the swinging gondolas, so we played it safe and rode in the stationary cars. What we missed out on thrills, we made up for by the beautiful sights we were able to catch. The Fun Wheel is a classic DCA ride, and we were happy to include it in our night. 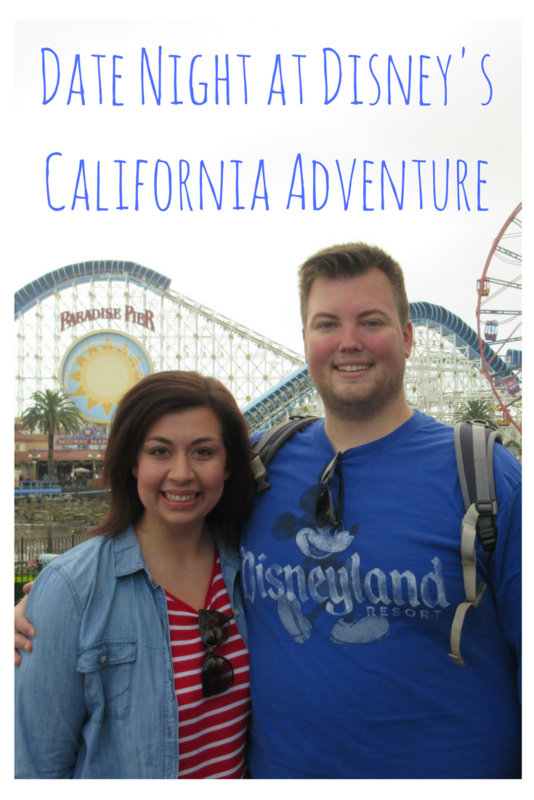 After getting off Mickey’s Fun Wheel, we decided to catch some of the action of Paradise Pier Boardwalk. I Immediately noticed that many people were walking around with cups that appeared to have alcoholic drinks in them. My boyfriend informed me that the park is completely alcohol friendly, and I felt it was only right to enjoy drinks like many of the other guests. I chose a margarita from Rita’s, and my boyfriend opted for a craft beer from Bayside Brews. We continued cruising the boardwalk, taking in the sights and sounds of the night. We realized there was already a line forming around the area that the World of Color fast pass was designated for. Because we wanted optimal views of the show, we decided to jump in line while we finished our drinks. We only stood in line for 10 minutes before we were let into the area to choose our spots. In hindsight, I wish we would have spent a little more time planning out where exactly we wanted to stand. When we were let into the area, we were a bit indecisive about where to go, and missed out on some primo viewing locations. Despite this, our spot was perfectly acceptable and we were still able to thoroughly enjoy the show. World of Color was the perfect way to end Disney date night. With the beautiful water formations, light patterns, colors and cameos of nostalgic Disney moments, it was truly mesmerizing. During moments of Disney movie clips, I felt reminded of the love that I had for these films, many of which I first enjoyed in my childhood. 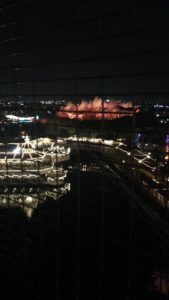 In times where water and light were the main spectacle, I was able to reflect on the beautiful night that I had just spent with my boyfriend. Towards the end of the show, there was a montage of Disney first kisses, featuring the classic princes and princesses. At that moment I truly felt like a princess in a Disney story, with my “happily ever after” enjoying the show right next to me.